Widely discussed cat health issues and why my cat vomits all the time. This is a common cat health problem, but is not always cause for alarm. Cats can vomit with great ease and usually very noisily. You will find that your cat may vomit for a wide variety of reasons. One of the most common reason for your cat to vomit is to get rid of hairballs that have collected in the stomach. Another common cat health issue that may cause your cat to vomit is they may have gotten a whole of some prey and eaten it without your noticing. This creature may have been mildly toxic like a lizard for example or a bug that just does not agree with your cats digestive system. The cat vomiting from the intake of these undesirable meals is actually their own well-designed defensive mechanism. Your cat may be vomiting, simply because it has eaten to quickly. This is very common and applies to my own cat Thomas, who gets so excited about the food that is placed in front of him that he doesn’t chew it well and swallows it mostly whole. The cat digestive system is intended to operate just like humans by the first step being the well chewing and breaking up of the food before it enters the digestive system. 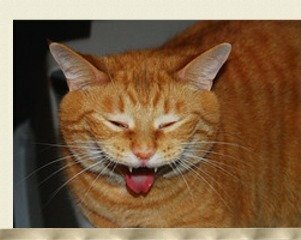 If the food is dumped into the stomach in whole form without being broken up by the teeth, you are most likely going to have cat vomit. The cause of this will be evident, as the vomit will contain whole pieces of food that have been un-chewed. In studying our cat Thomas and his eating behavior, we noticed that he seemed to be rushing his meal because him and his sister would eat together. He would be worried that she was going to finish and then eat his food. He would eat very quickly and constantly look back at his sister to see how she was progressing with her meal. The closer she became too finishing her meal the faster he would eat, even if it meant not chewing the food. We solved this problem by feeding the two cats in separate rooms. I also spent some one on one time with Thomas while he ate his meal. When I noticed that Thomas was not chewing his food. I would talk to him and stroke him to give him a chance to stop eating and relax a minute. This pausing during his meal would extend the time it took him to eat, but overall, he would chew more of the food. After a few weeks of using this method, Thomas realized that his food was not going to disappear and that we would sit with him until it was gone. This has turned mealtime for Thomas into a relaxing slow enjoyable moment for him. And I can say “knock on wood” he has not thrown up in several months.